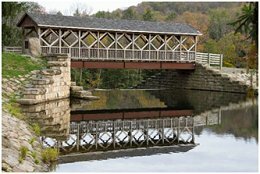 The Eric Benjamin Bridge, a wooden covered bridge over the cascading waters of the spillway of the Marilla Reservoir, welcomes visitors to this pristine recreation area. 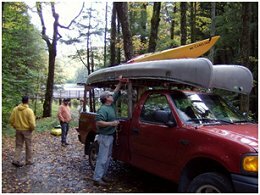 Miles of hiking trails, free public access, along with fishing, kayaking and canoeing opportunities await visitors to this scenic watershed area. Marilla Reservoir, constructed in 1898, is located along Rt. 346, approximately 5 miles west of the City of Bradford, Pennsylvania. 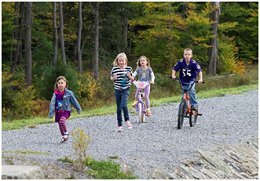 The Marilla Bridges Trail begins at the covered wooden bridge and loops around the reservoir. On this trail you will enter portions of wooded areas and cross two long, and scenic wooden bridges. This 1-mile, crushed limestone trail, is easy and very family friendly. There are a number of trails, which connect into this trail, ranging from easy to moderate in difficulty. The Marilla Reservoir, part of the properties owned by the Bradford City Water Authority, is available for public fishing under a cooperative program with the Pennsylvania Fish Commission. Periodic trout stocking occurs to provide year-around fishing enjoyment. Ice fishing is a favorite in this scenic location, as are kayaking and canoeing. Hunting on the watershed is encouraged. Ample populations of deer, turkey, and a variety of small game inhabit the watershed. The Bradford Watershed Authority is a partner in the Kinzua Quality Deer Cooperative research area, working to provide expanded information on white tail deer and forest management. Please remember when hiking or fishing in this woodland setting to “Pack it In, Pack it Out”.